Hitting the “like button” too! Brave or not, pioneer or not, this is still excellent. Love to see creative problem solving, "make it so" as Captain Picard would say. 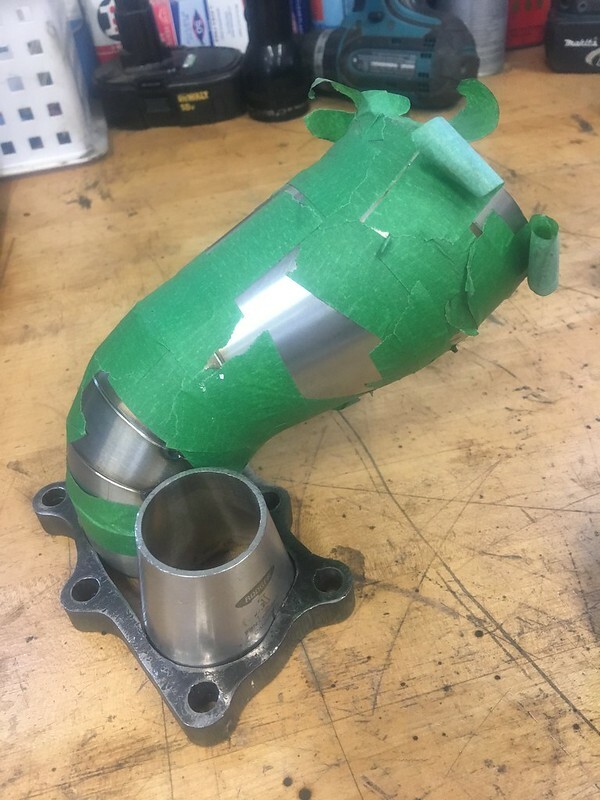 Since I have some time to contemplate the build before my next round of actual work, I've been reading and plotting about 2 upcoming items on the build which are the MAF placement/intake pipe design and oil cooling. I've settled on using the R35 slot style maf long ago so now I needed to figure out the details on pipe size, material, routing etc. 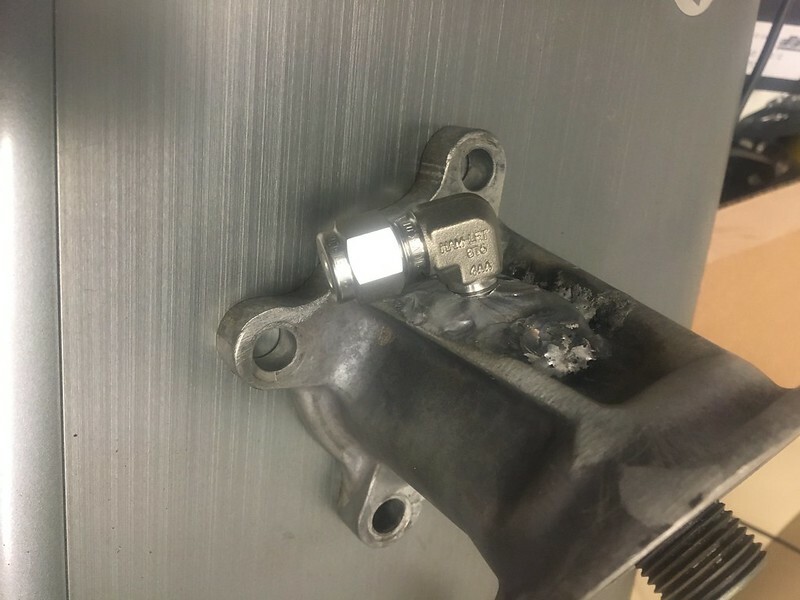 This sensor allows airflow in axially and expels it radially back into the flow which makes it robustly reliable against reversion during shifts on a turbo car. 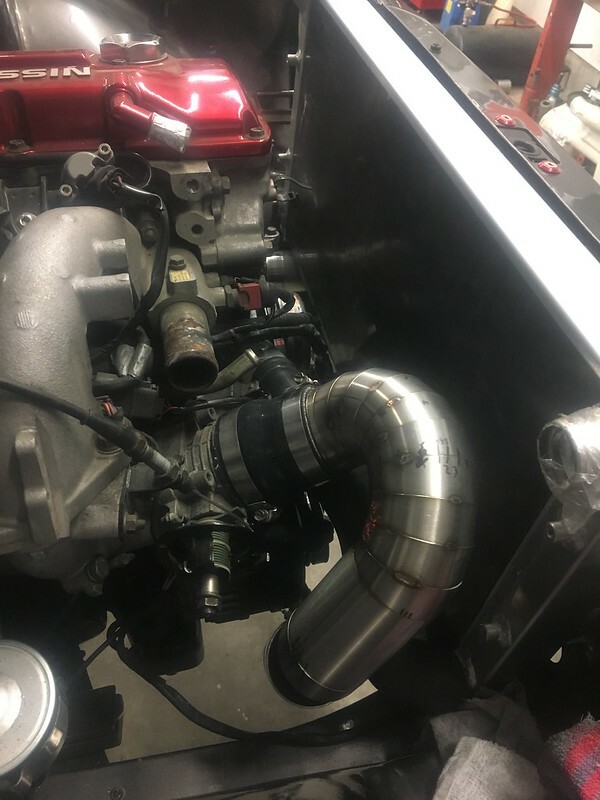 With a 3" tube, Nistune has experienced a maximum of about 320rwhp which is perfectly sufficient for this build and provides good resolution. 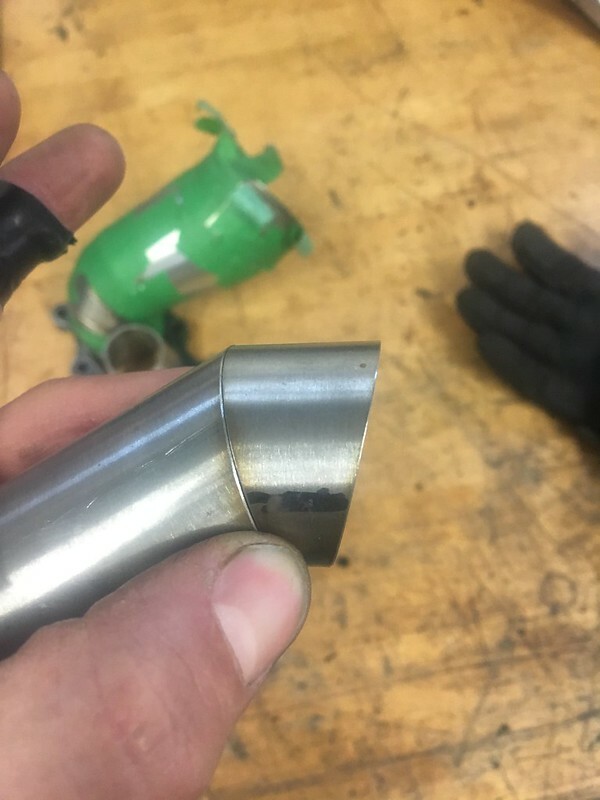 There are weld on slot style maf adapters for a bunch of different piping diameters so it is important to get the correct one so the radiused contour matches the tube size and so that the sensing guts are placed in the center of the tube. 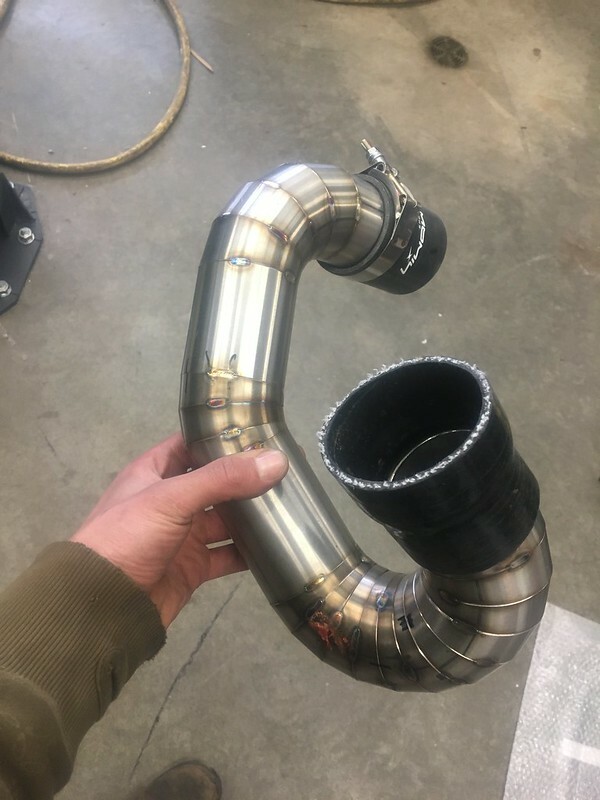 I originally hoped to use 2.75" tubing for the MAF yielding ~270rwhp max (scaled by the pipe area ratio) and allowing less pipe size change to get me down to the 2 3/8" turbo inlet but there are no MAF adapters for this pipe size so I abandoned that plan. Planning the piping and filter arrangement also took some thought. I miraculously found an ASME research paper on turbine inlet design researching inlets using straight or bent pipes. 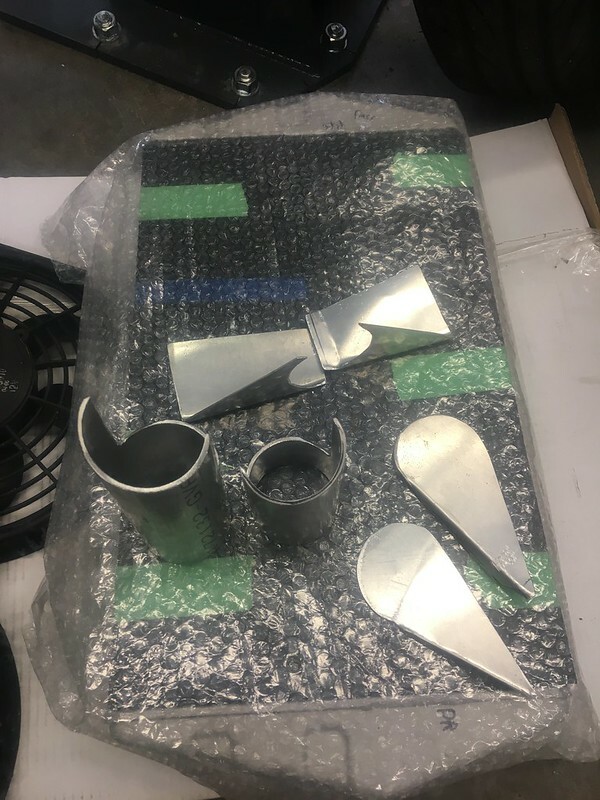 Unsurprisingly, a straight inlet pipe is better since the bent pipe causes a non-uniform distribution of axial velocity and pressure which causes uneven loading on the blade tips. 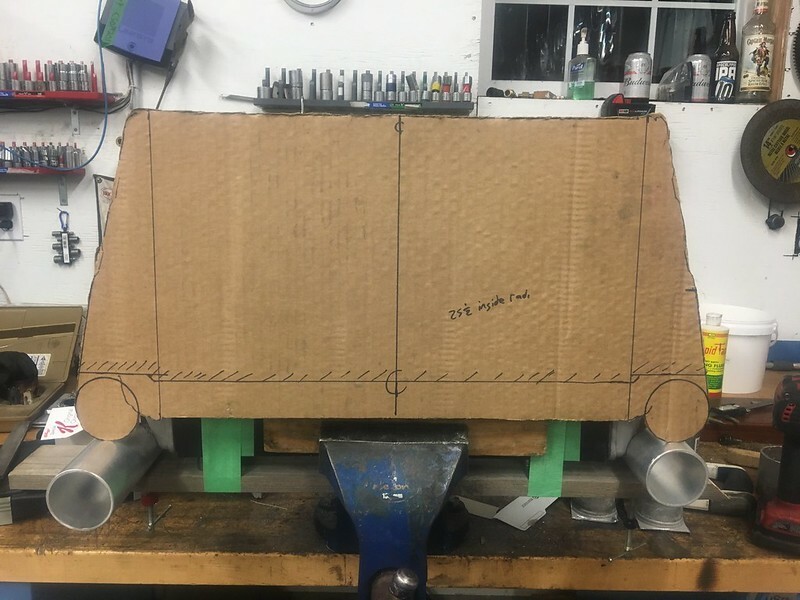 With that in mind, the inlet piping from the 2 3/8" OD compressor inlet will be: 2.375 to 2.5" silicone coupler, 2.5" straight tube, 2.5" to 3" concentric reducer, 3" mandrel bend, 3" tube with slot style MAF adapter, then 3" cone filter. This will maximize the straight inlet design to the turbo and give me some space to Y in my BOV recirc line on the 2.5" straight section. 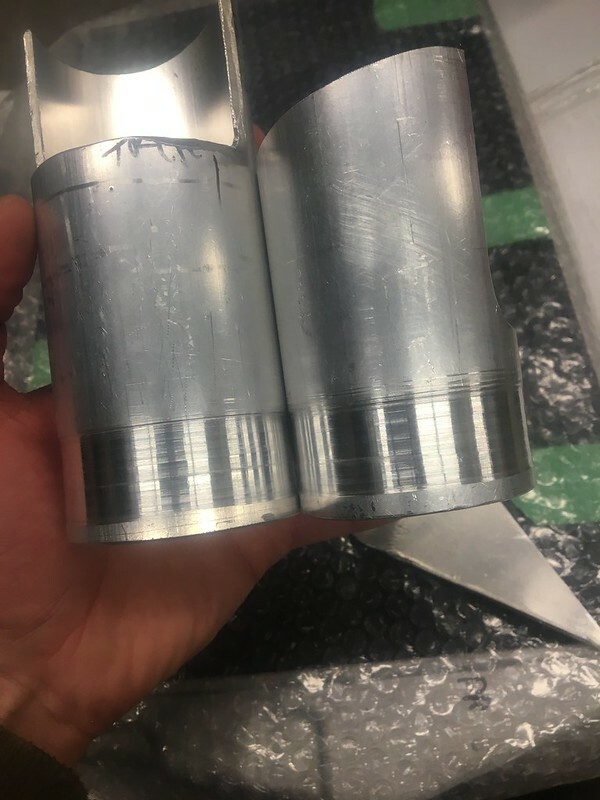 The MAF will be placed in the straight 3" tube with the length from the filter matched to OE specs to leave a maximum straight run downstream of the MAF. 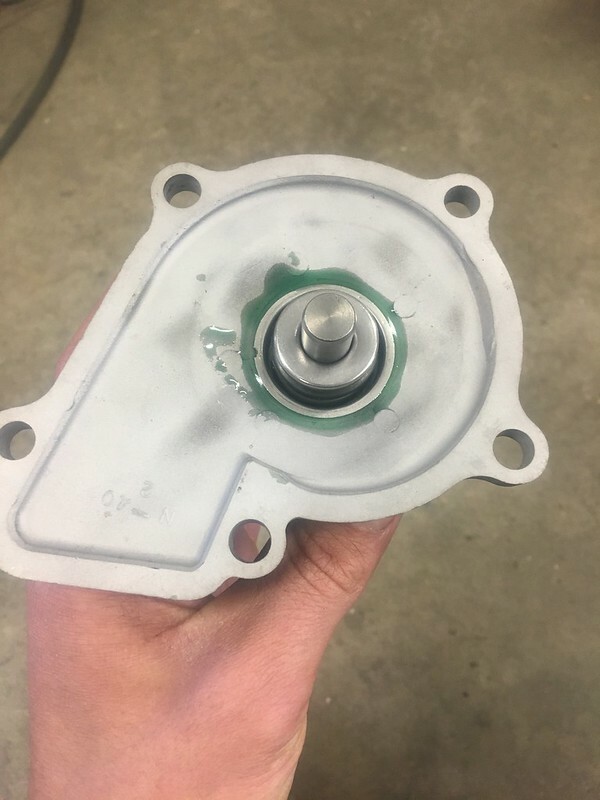 OEM MAFs use grating in the inlet and sometimes the outlet. 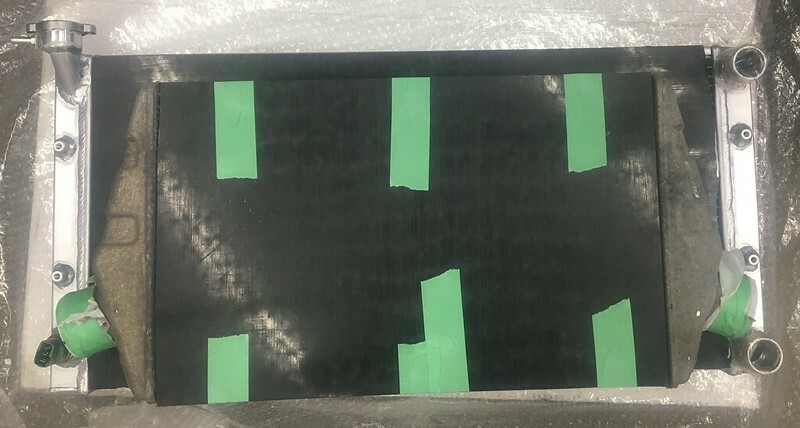 Hitachi's patents call it "upstream flow rectifying grating" which is probably a more accurate description since velocities in the tube are too high to accurately call it a flow straightener (which is traditionally for laminar flow). Its objective is to introduce a minor amount of turbulence throughout all operating conditions to knock out eddies and vortices which mess with the sensor linearity. 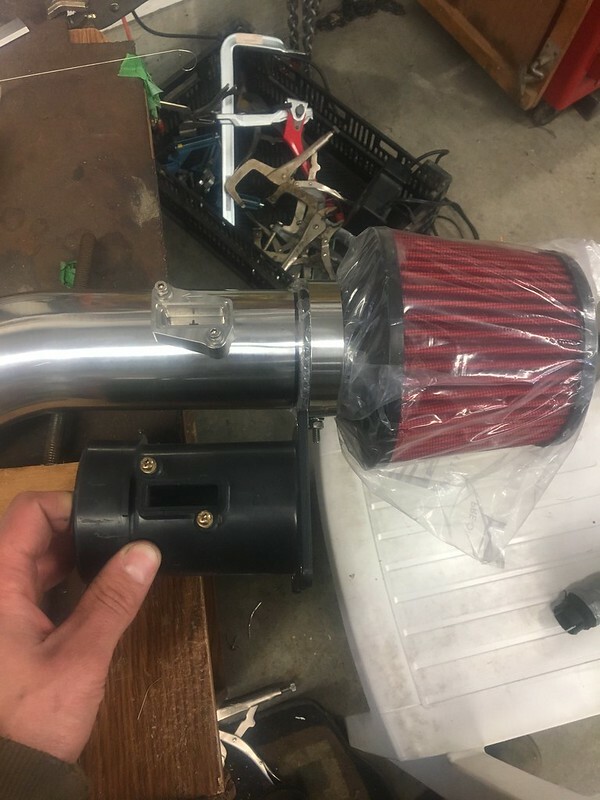 With that said, I am going to run mesh on my pipe inlet right where it receives air from the filter and match the distance between the sensor and mesh to the OE plastic housing. I want to do everything I can to have the best sensing possible since measuring the airflow accurately is really the backbone of a good tune. 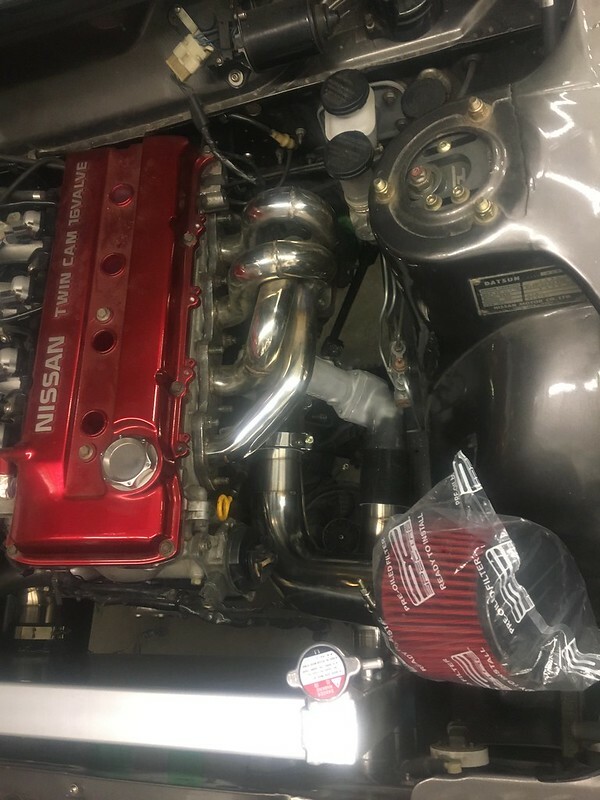 I originally wanted to run an RB25 filter adapter with the OE oil--> water cooler but there is not enough room under the intake for the whole thing. 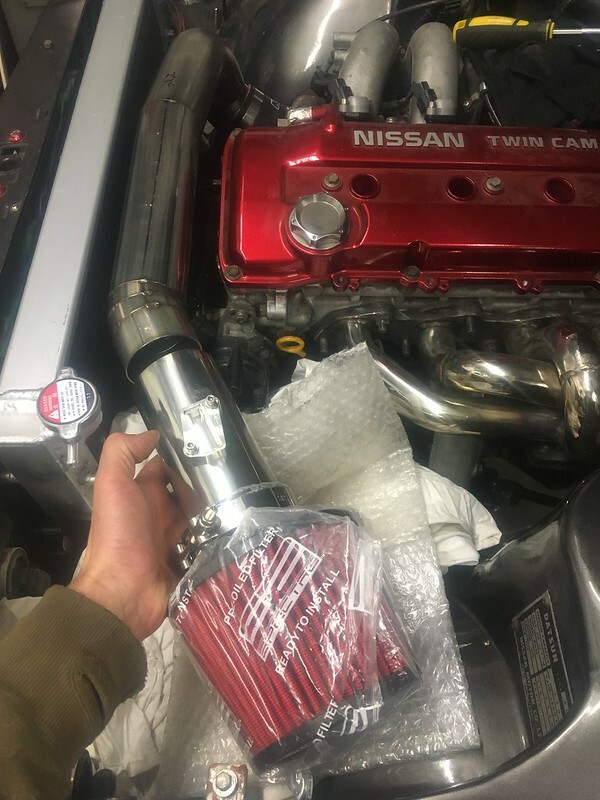 Some SR20DETs come with a similar (but shorter) stack o pancakes cooler. The flagship Pulsar GTiR comes with a cooler the same size as the RB25 and RB26 which are all almost double the thickness of the SR20 cooler. 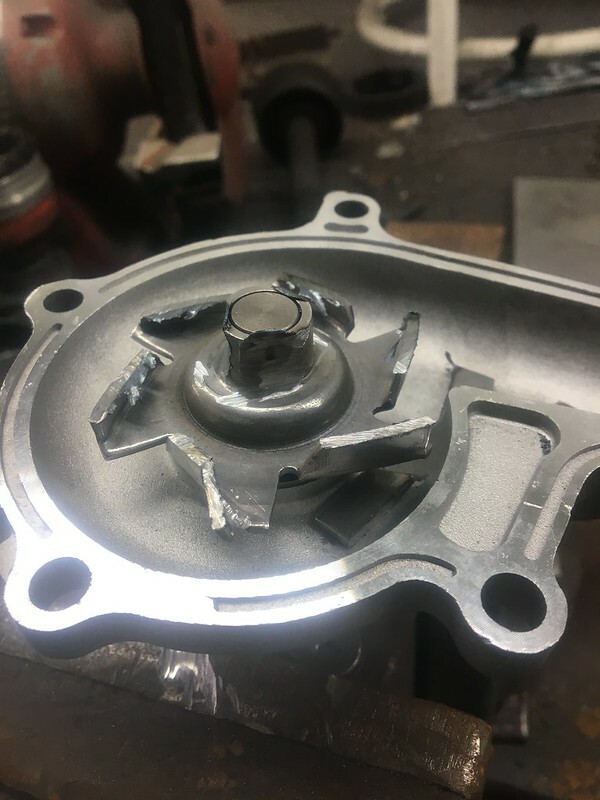 In recent years, it seems many OEMs have gone with oil coolers to help facilitate longer oil drains since oxidation is the fastest killer of engine oils. 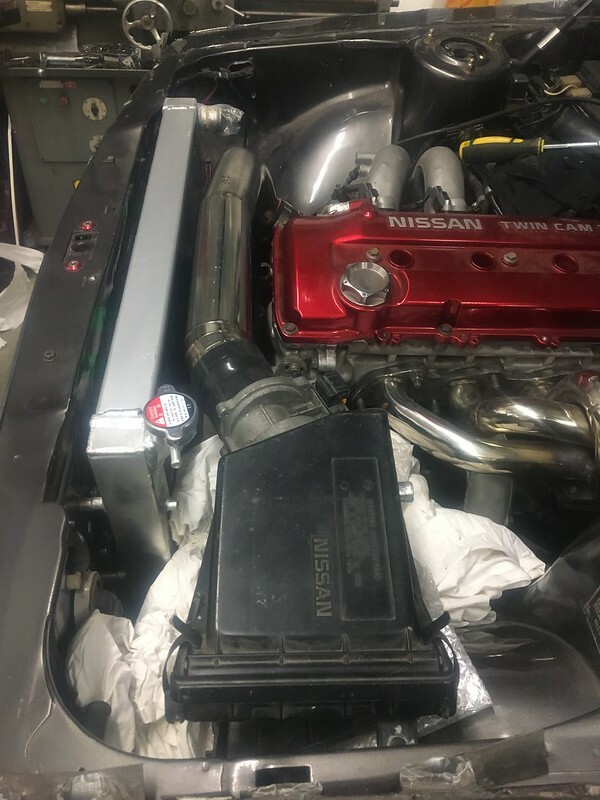 Some of the newer Nissans utilize a similar cooler to the 90's ones that bolts in between the oil filter and the oil filter mount. 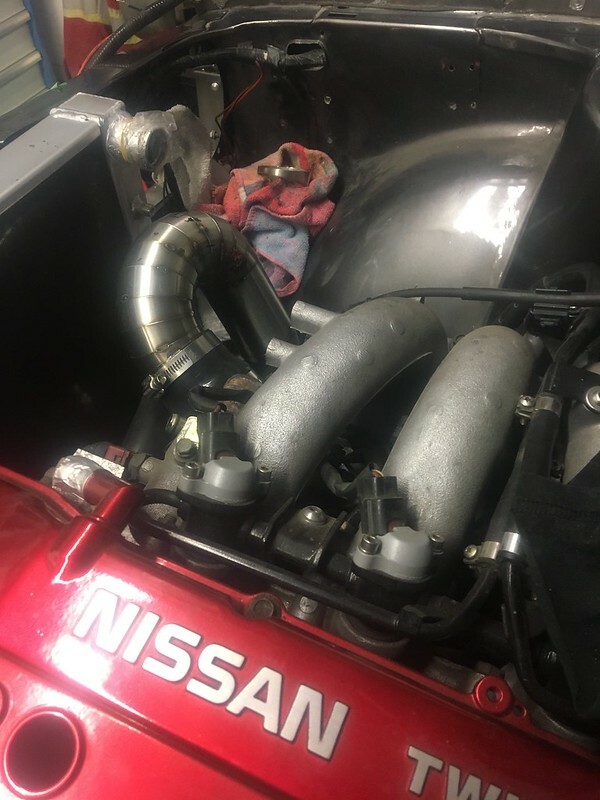 If there is sufficient clearance to the lower intake manifold, this will be a pretty elegant solution. It'll probably require a custom machined bolt to assemble but that's not a deal breaker. 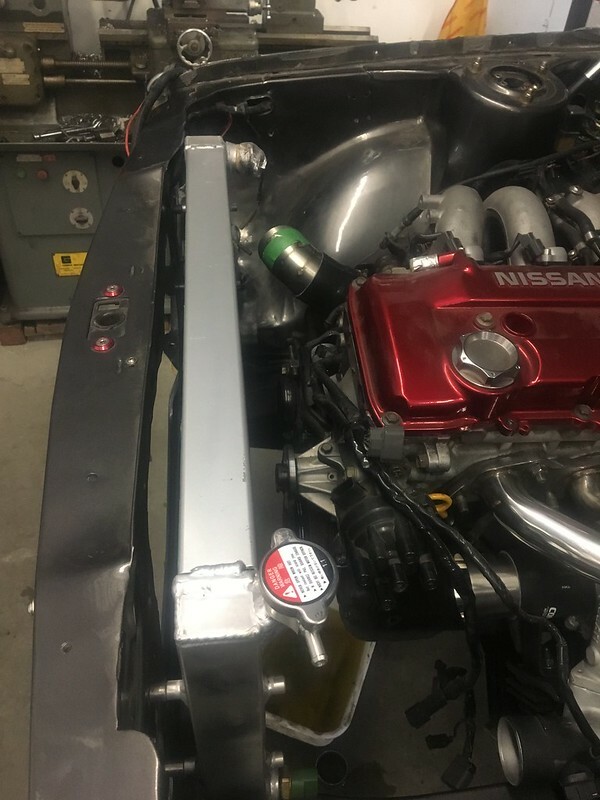 I also feel much better running smaller, cheaper, lower pressure, and less-critical water lines for an oil cooler over and Air-oil cooler with all the lines and thermostat to go along with it. 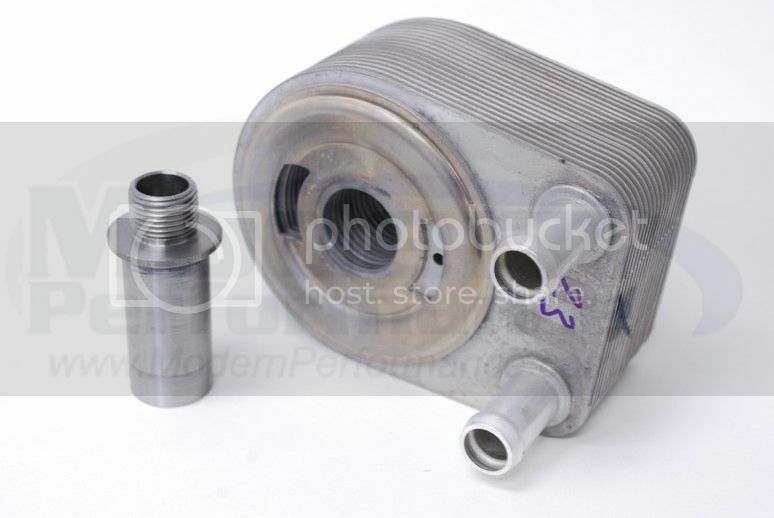 I figure a V6 or V8 OEM oil cooler will be sufficient cooling for my street build. 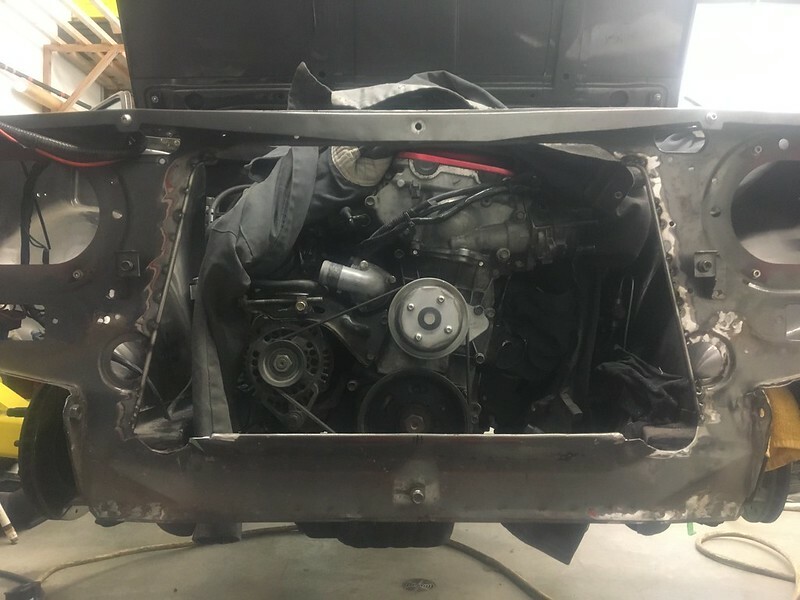 Perhaps in the future I'll build a 5-6qt (stock is 4 with filter) hammerhead oil pan to improve ground clearance and cooling but we will see where this goes first. Interestingly enough, Mopars have been using an almost identical setup to the Nissan one in everything from Jeep Liberties to Dodge Challenger SRT8s. 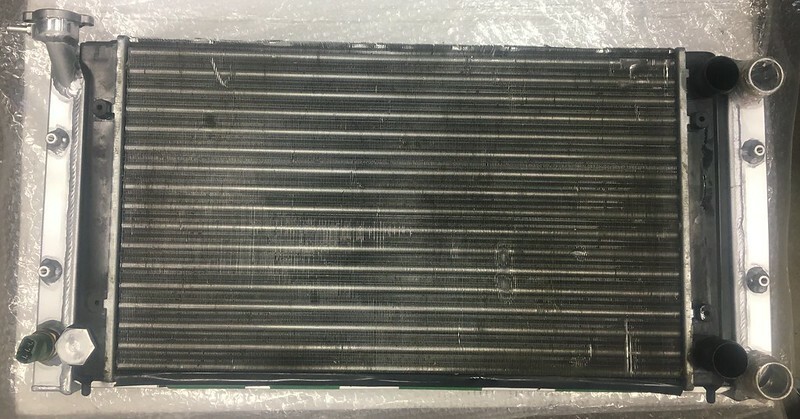 Funnily enough, the SRT8 coolers are 19 layers just like the RB25/26/GTiR coolers! 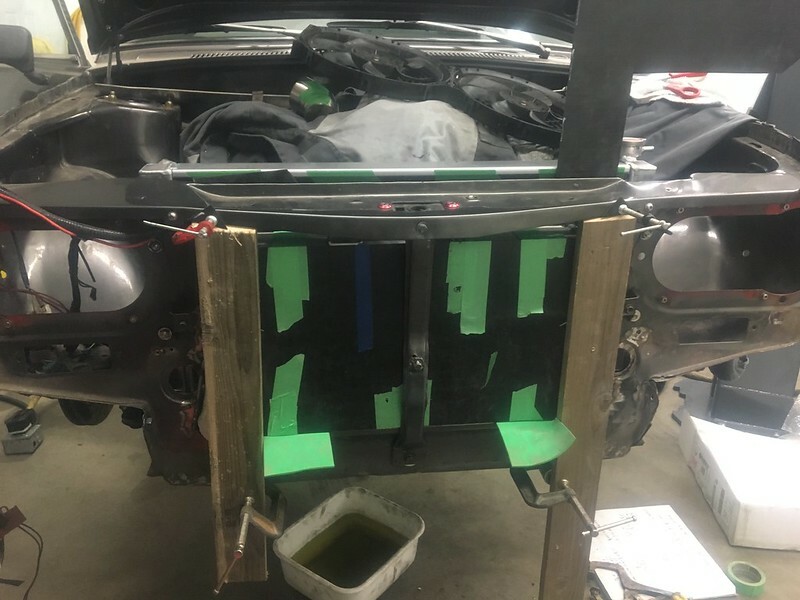 Chrysler 300 owners install the "police package" oil coolers to reduce oil temps during spirited drives and claim reductions from around 250F to 225F and see oil temperatures drop much faster than without a cooler. Between the large displacement Nissan and Mopar coolers, I'm sure I'll be able to find something suitable. Obviously this will put more stress on the cooling system so I'm in the market for something with higher capacity there as well but that's a job for another day. That's all for this week's research. 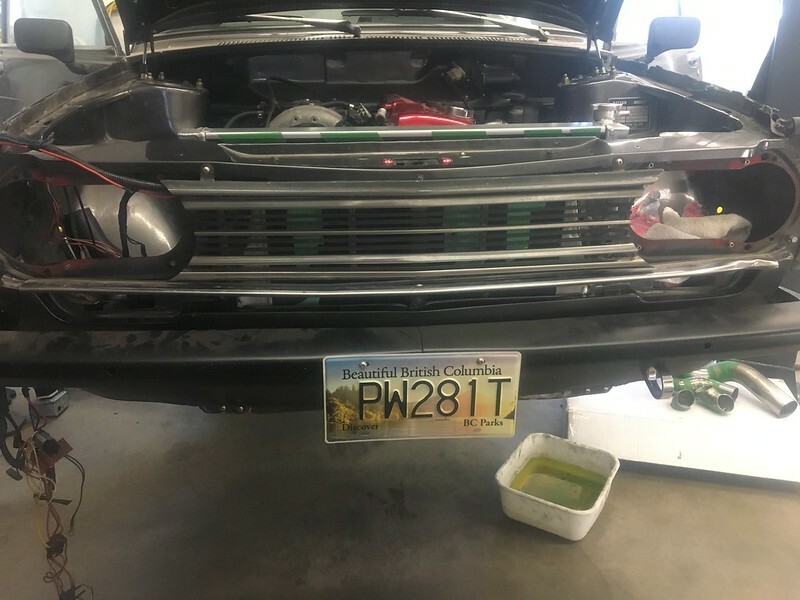 The bolt on plate coolers are great information. 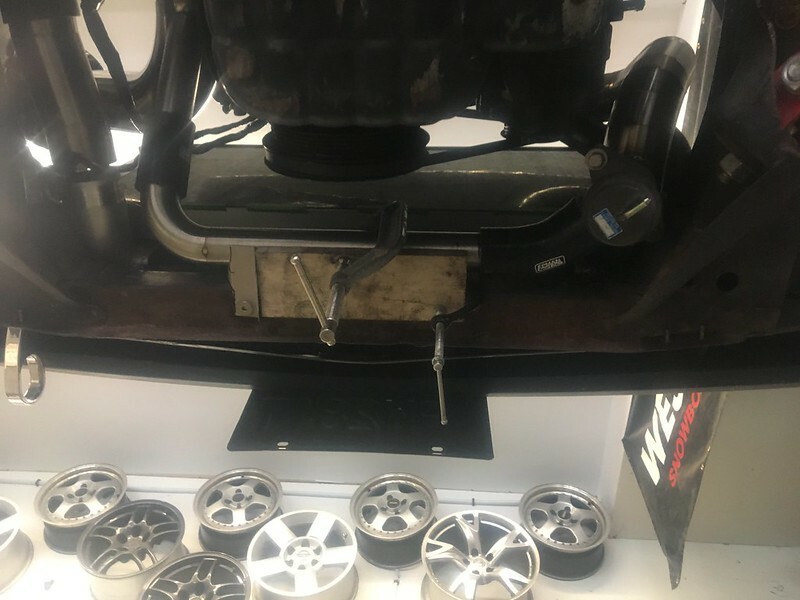 I have a 13 plate NASCAR type cooler built into my rad, and it works very well - keeping the oil at radiator temp in all conditions. Infact under cold conditions it’s actually keeping the oil and coolant too cool! If these coolers can be utilized inline in standard applications or in addition to remote mounted filters, it’s a much simpler upgrade. 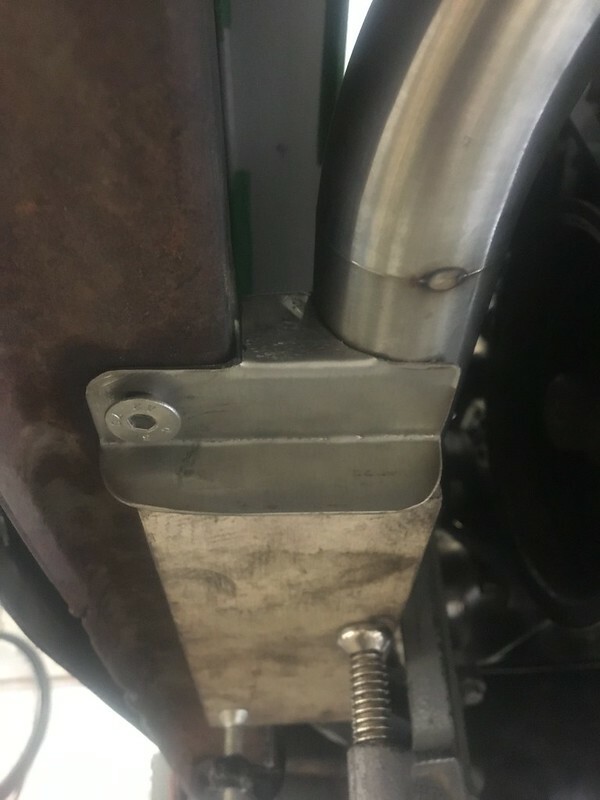 The one item that’s always bothered me is on the Bronze build that my radiator with bolt in oil cooler is very custom. It elegant I feel, and works absolutely perfectly. But should I ever take a rock to the rad or some other damage on a road trip, I’m hooped, as there is no ‘on the fly’ alternative. 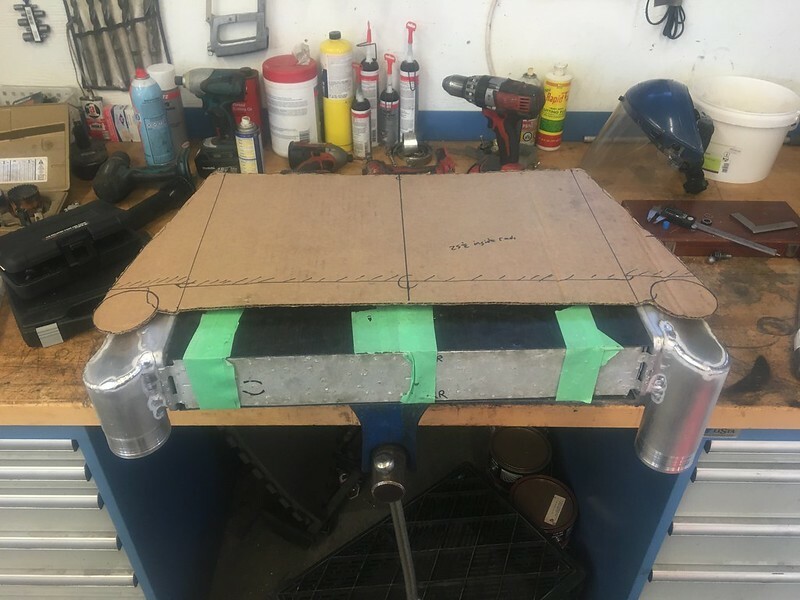 Using an OEM rad and a separate OEM cooler like you have mentioned above makes a road side repair in some remote area much more possible, as you could at least bring parts in. When I built my rad and oil cooler combo 10 years ago, this option of cooler wasn’t available. Gets the noodle going. Thanks! Byron, I agree on the custom stuff. So cool but so terribly unfortunate if something ever happens to it. I fear curbs greatly with my tubular rear control arms since it would be disastrous to bend or break one! I haven't pulled the trigger on an oil cooler yet but will keep y'all posted. 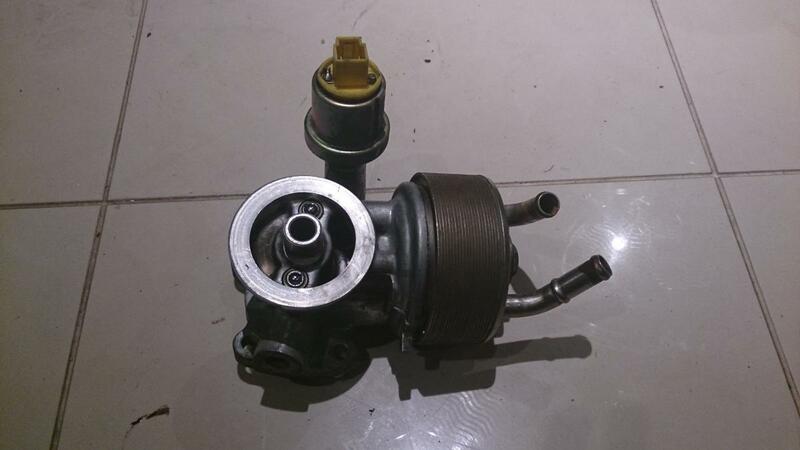 In this instalment of never ending Datsun projects: Josh spec Altima water pump, eBay rad, custom Mitsubishi Evo 4 intercooler, and oil filter block mods for turbo oil feed. 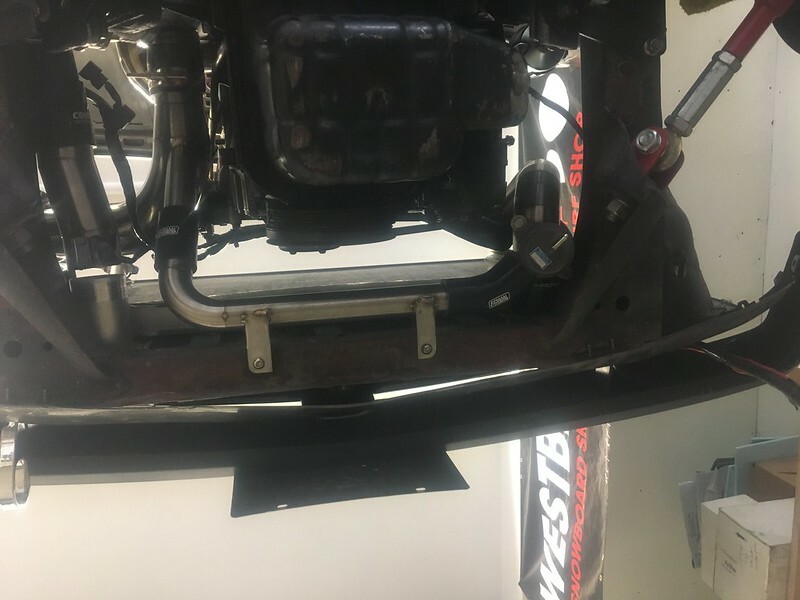 After seeing pics of Josh K's water pump setup, I was convinced that was a good route to go to gain the much needed clearance up front in addition to the new engine mounts that moved the engine back, down, and squared up the nose. Josh's pics here. 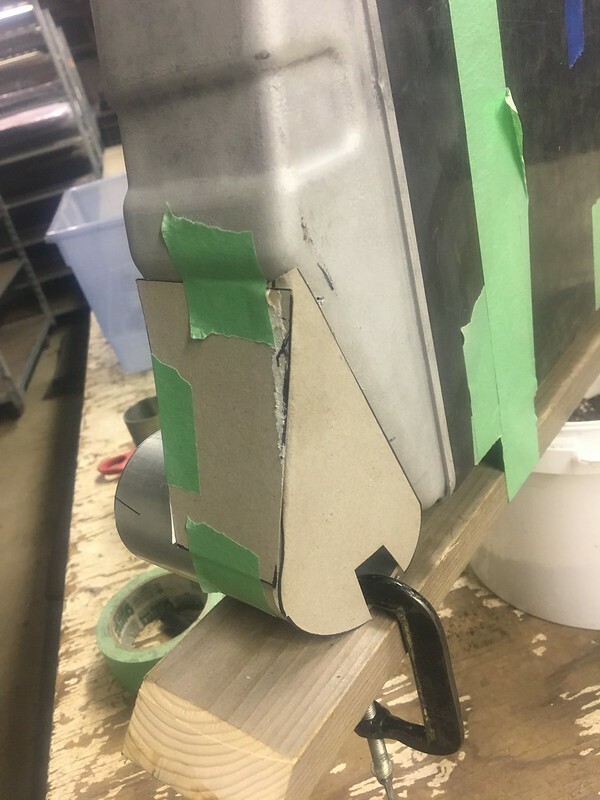 Measure carefully and remove material from the front of the housing about 8-10mm. Too much will interfere with pulley, too little is OK.
Measure fits and touch up if required. 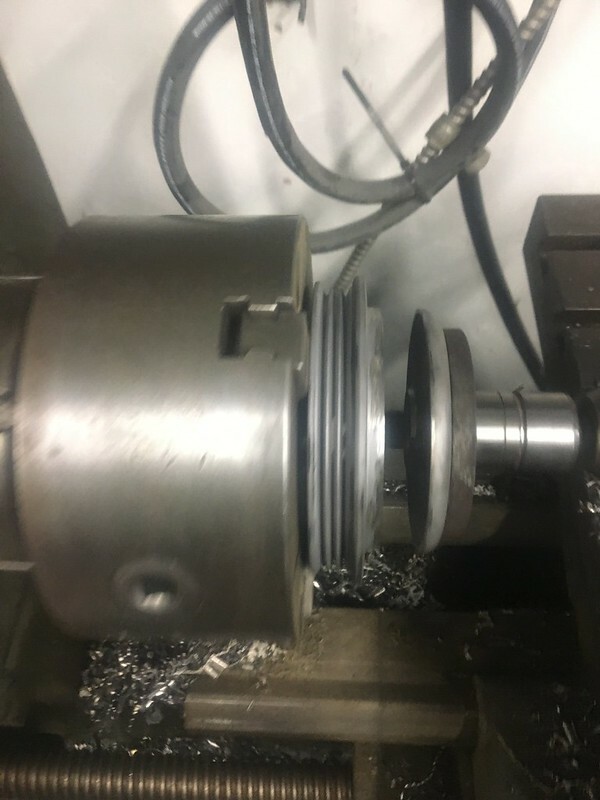 I machined the pulley flange fit down so I could still use the rwd KA pulley flange. 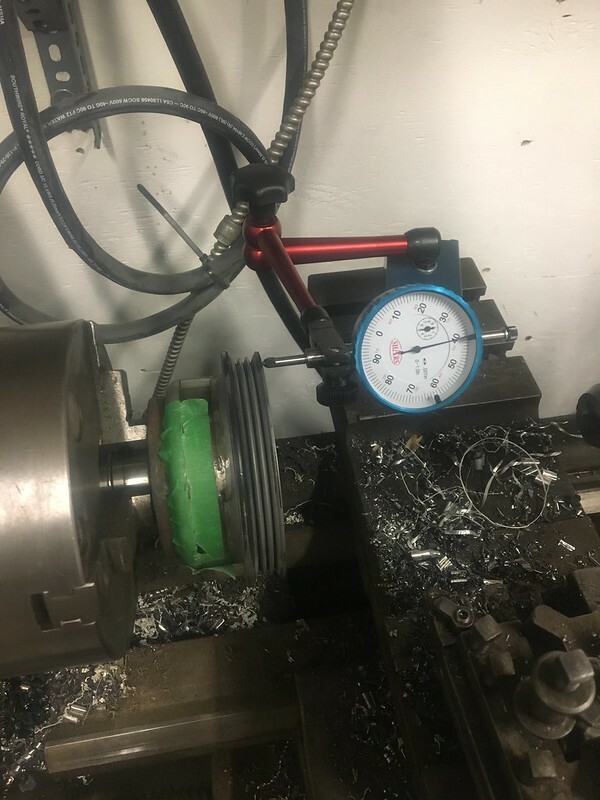 Build a jig so you can press the rotating assembly into the pump and set it with the correct spring pressure on the mechanical seal. Sockets and washers work well for this. 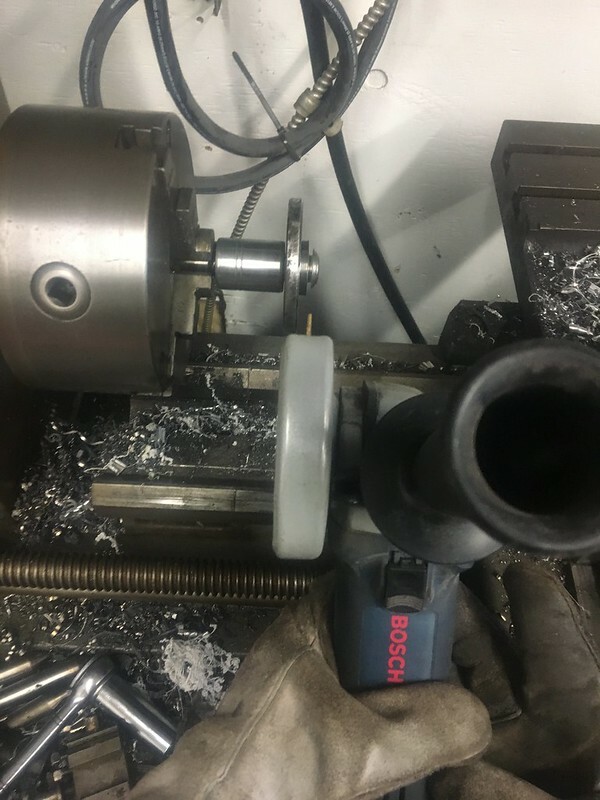 I machined a few mm off the pilot of the rwd KA pulley flange to gain about 4mm and it would overhang the shaft anyways. With some retaining compound, press fit the works together. 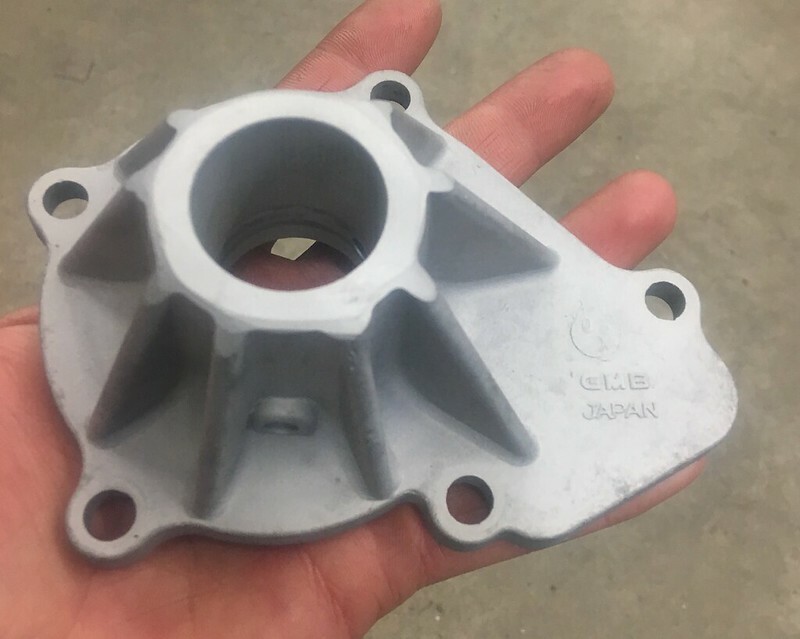 I used Loctite 680 and pressed the rotating assembly in first, then the flange and then impeller. Voila. Enjoy your extra 15mm of clearance! Precision zip cut + lathe combo. They don't call it precision ground for no reason! We'll call it 15mm for easy figuring. 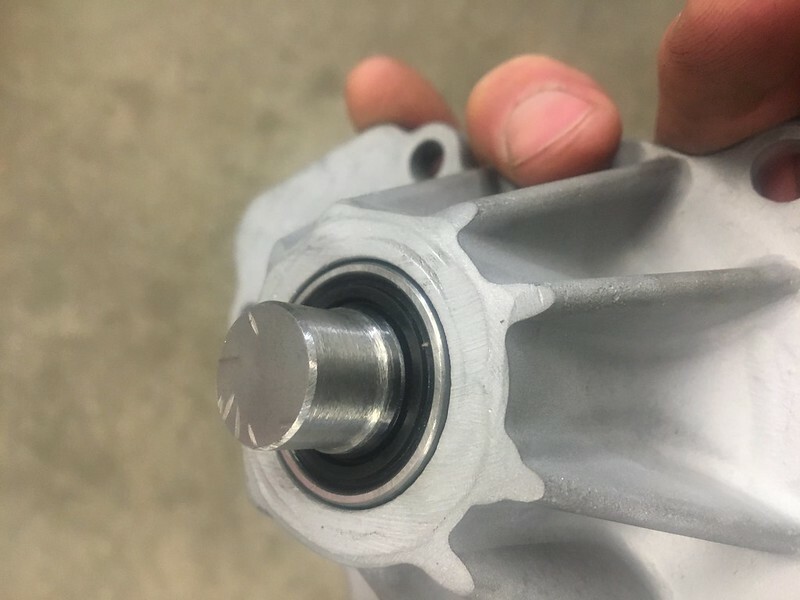 With the pulley you can go 2 ways, retain the 3 rib pulley on the crank pulley and use KA24E alternator parts or go back to KA24DE parts like Josh. I opted for the latter which involves sectioning the pulley and widening it to increase the offset to push the belt onto the middle sheave of the crank pulley. 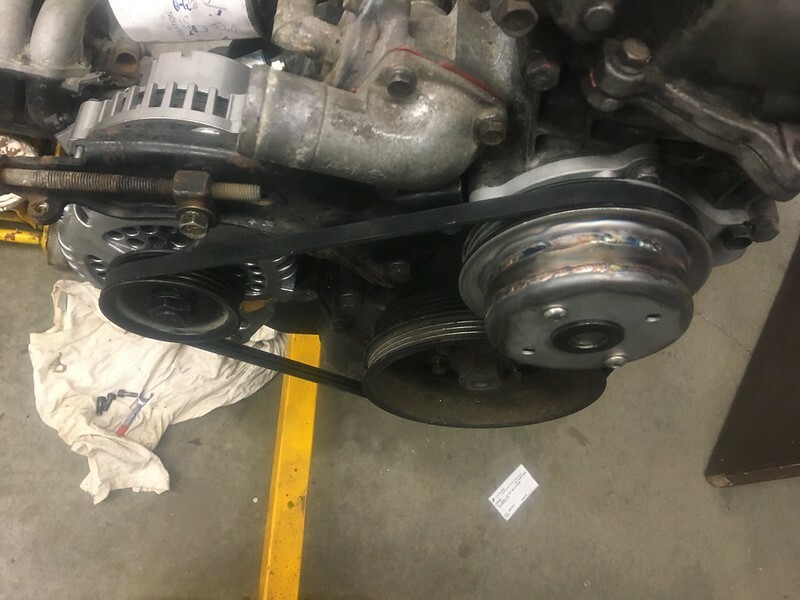 After going back to the KA24DE alternator parts, I could use the same 3 rib belt but have everything pushed rearward one sprocket worth basically. 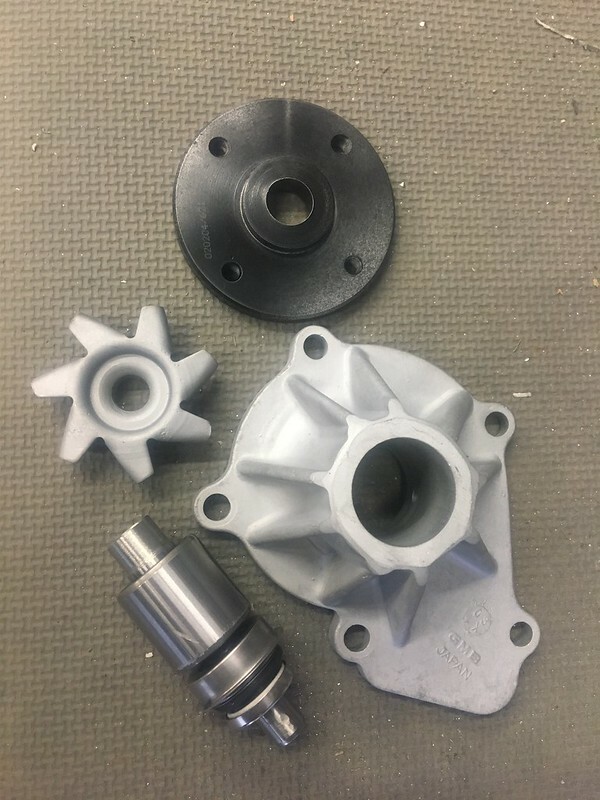 I'd like to build a billet pulley in the future that would increase the diameter to maintain the stock belt speed ratio and eliminate the runout that I have on the current pulley. I have less than 0.010" radial runout but close to 0.030" axial unfortunately. It should be enough to get me going I think. I haven't actually put the parts in the car yet but it should free up enough room to run a pair of puller fans and a proper fan shroud with a decent radiator and FMIC. I can slip a pair of 10" fans in with room to spare with the original setup so an extra 15+ mm of room will be money. I bought a cheap radiator off of eBay and I have to say I'm pretty impressed. It was only $133USD shipped to WA. The VW thermoswitch bung is in the correct location and the correct size so that's a bonus. It's 25.5 x 12.5 x 1.5" dual core compared to my current Nissens 651511 at 20.6 x 12.5 x 1.25. It should be adequate cooling once shrouded in properly. My RB25 Silvia with no rad shrouding is 25.1x14.1x2.5" and has no issues so I'm optimistic. 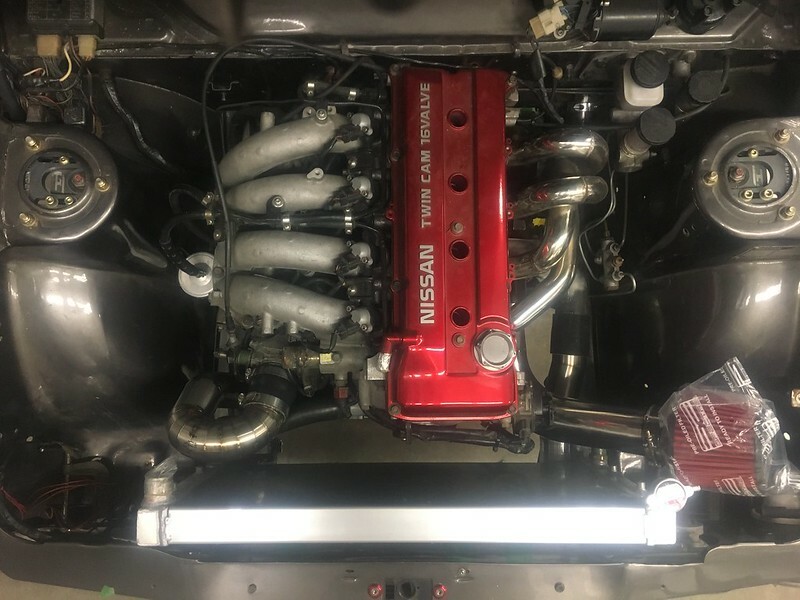 It has a water cooled turbo and the OE Nissan oil--> water HX. I converted the mounting lugs to use studs and I can vary the spacers to set the rad depth from the core support. 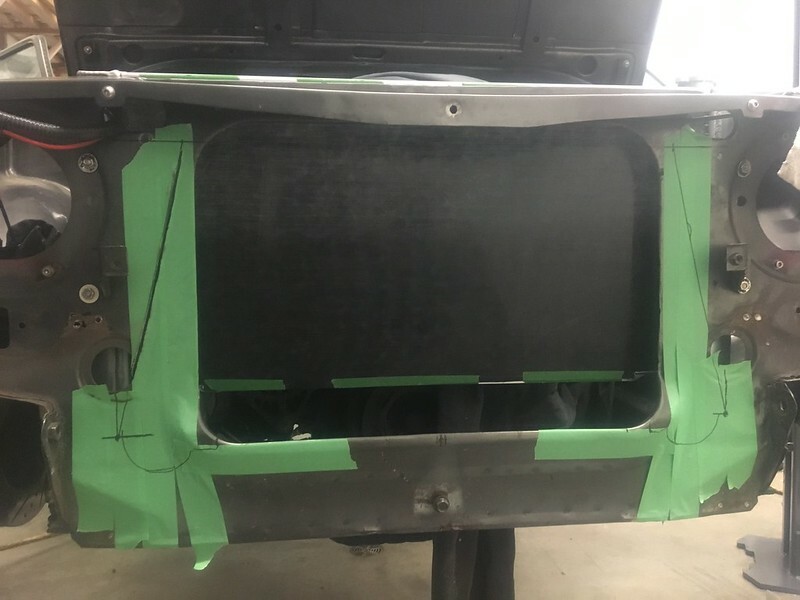 The filler neck just clears the hood and just allows 2.5" piping with silicone couplers between the bottom of the rad and the frame rails. The Evo 4 intercooler will be made to work I think. 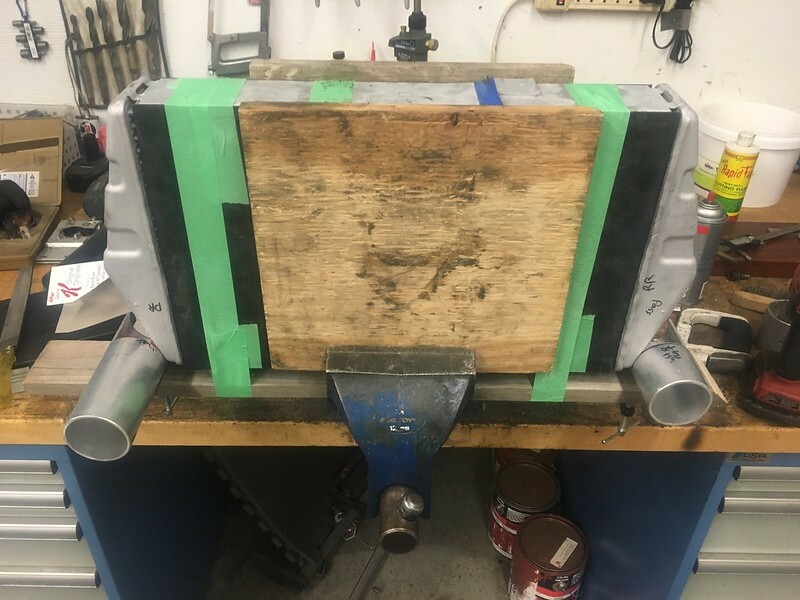 The core dimensions are 18.5 x 11.5 x 2.5 bar and tube so there are large flanges at the ends of the core but I think I'll be able to make it all fit. I've cut apart the end tanks to allow a different design that sends the piping straight back since there is no room up front for couplers etc. On the hot side, I've left the inlet pipe long enough to clear under the radiator and protrude for easy fitting. On the cold side, the outlet pipe is shorter and most of the silicone coupler will go under the rad since there is little room available. 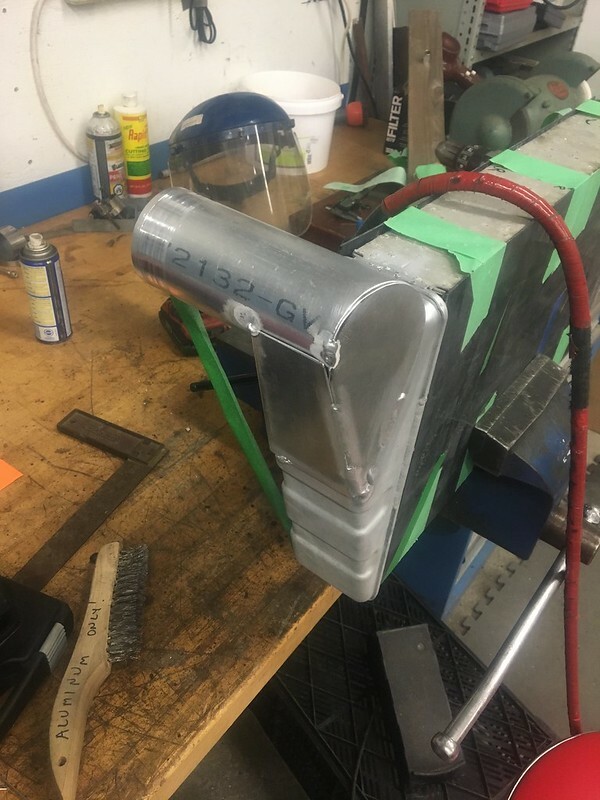 I am hoping that my prep work on the end tanks will make for reasonable welding but we will see! After a few rounds of degreaser, pressure washing, compressed air, bead blasting, repeat washes etc, I think it's ready to be welded. 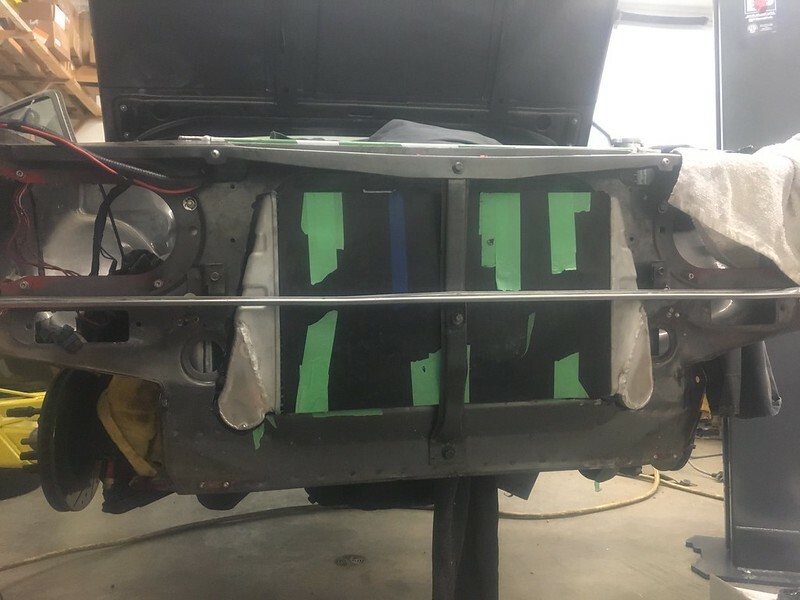 The bottom of the intercooler with sit flush with the current rib on the valence and the top of the intercooler leaves just enough room for the hood latch. 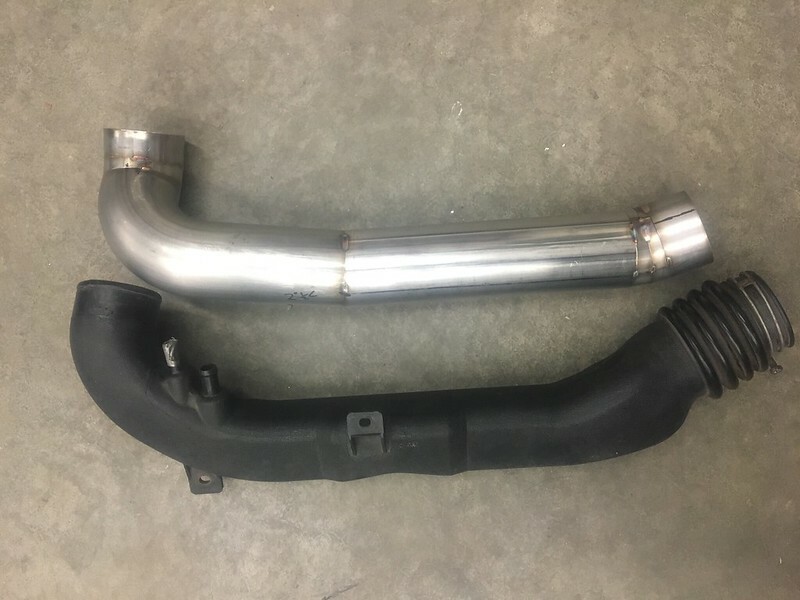 As much as I'd love to mod the intake manifold to (Josh spec) to get a straighter shot between the throttle body and the intercooler, I will be able to make it work with some tight pie cut bends. I'm very excited to weld some steel again. For the oil feed to turbo, I didn't want to octopus too many things off of the single auxiliary 1/8" BSP fitting on the filter block. 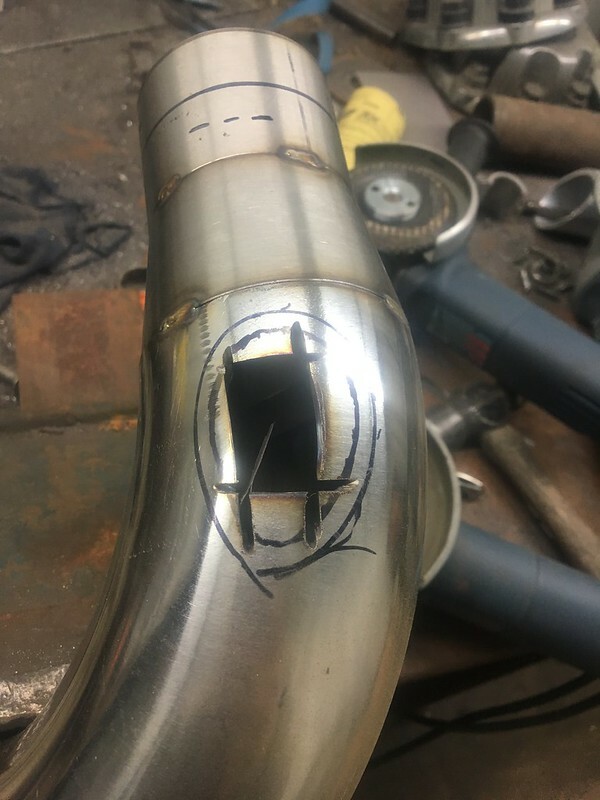 I opted to weld some buildup to the top and D+T for a 1/8" NPT x 1/4" tube Swagelok elbow which will get me set in the right direction toward the back of the block for 1/4" oil feed hard line. The factory oil filter block was a miserable chore to weld but thankfully the critical parts are well stuck together. Great work Jordan! You are doing some amazing stuff. 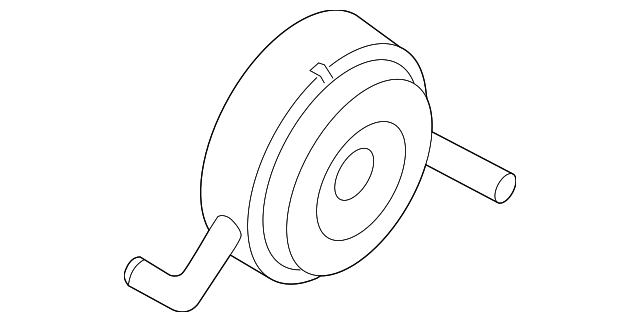 Looks like you already had a KA24E water inlet on there. 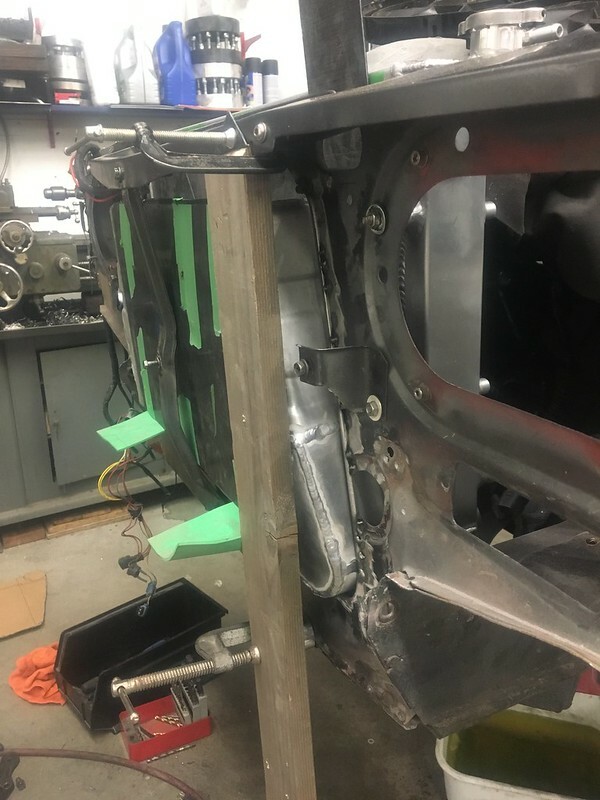 The KA24DE inlet sticks way father out and you have to notch and weld it to clear the belt. Put another long weekend into the car and I'm happy to say that I have something to show for it! 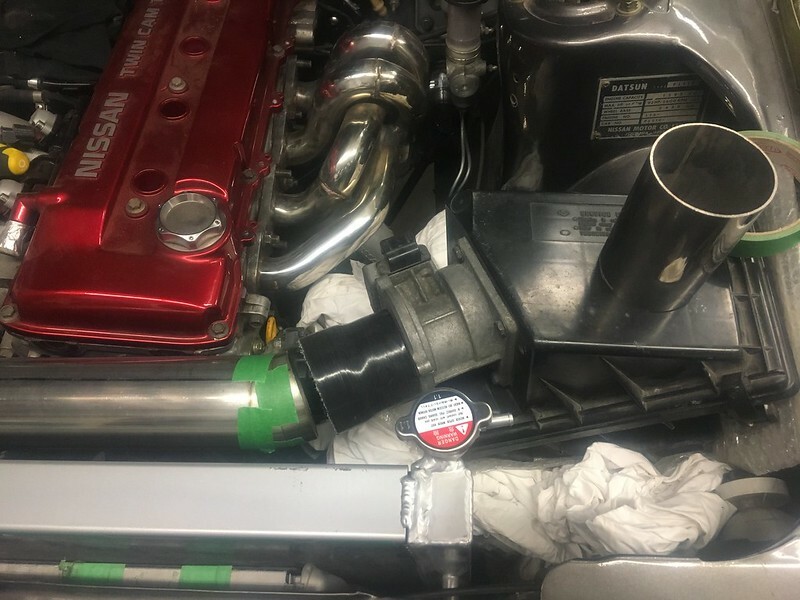 I touched up the hose ends of the intercooler inlet and outlet just to get some striations on there so the coupler won't slide. I didn't want to take much off since the tube starts at 2.50" to begin with. Just to recap, the core is a Mitsu Evo 4 core with custom end tanks. 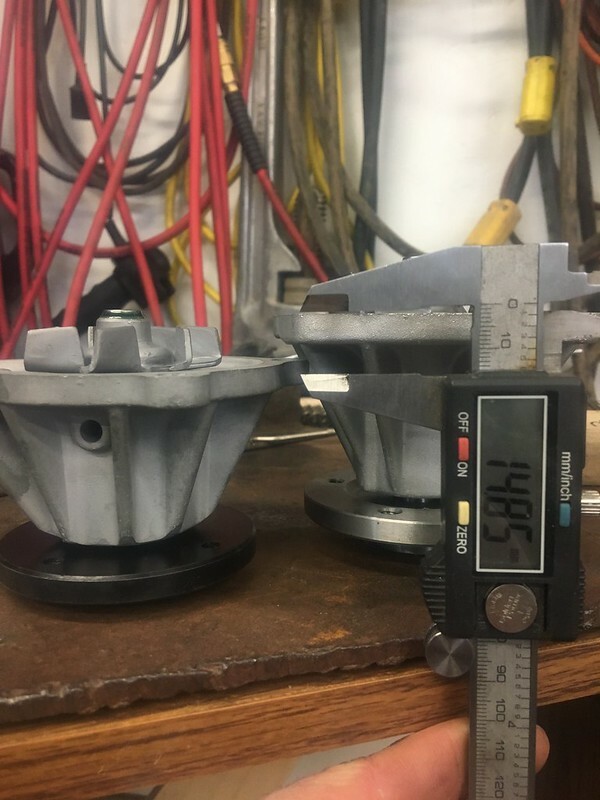 Stock core is tube and fin 18.5x11.5x2.5 (470x300x65). 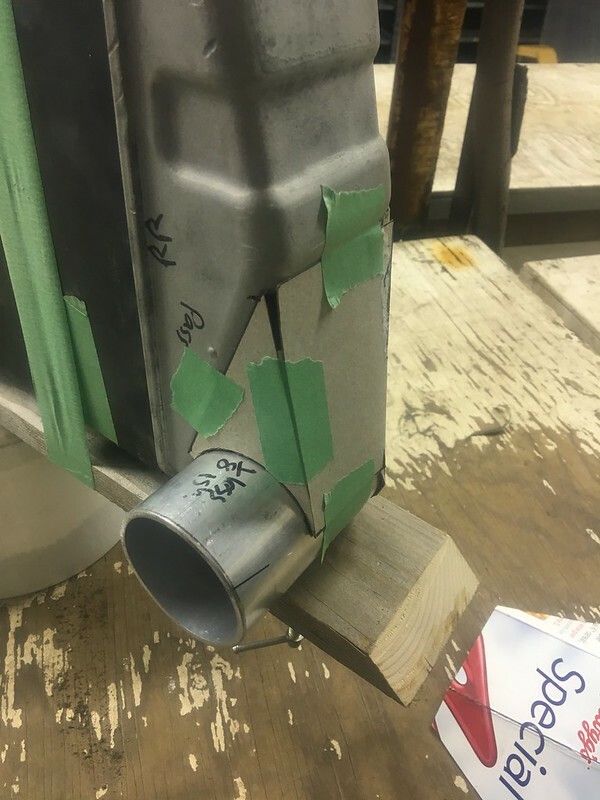 The end tanks are 1/16" plate and the piping is 2.5" 0.125" wall 6061. 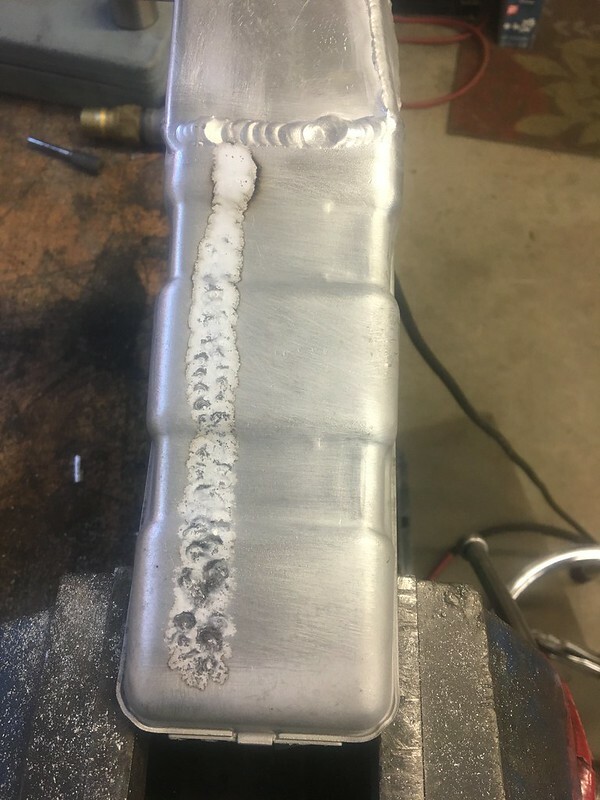 I was pretty nervous embarking on welding the old corroded aluminum but thankfully I had no burn throughs! Thankfully all the cardboard template, fitting, and cleaning work was done beforehand so it went together relatively quickly this time around. Fitted. Managed to retain the stock core support which is kind of a bonus. 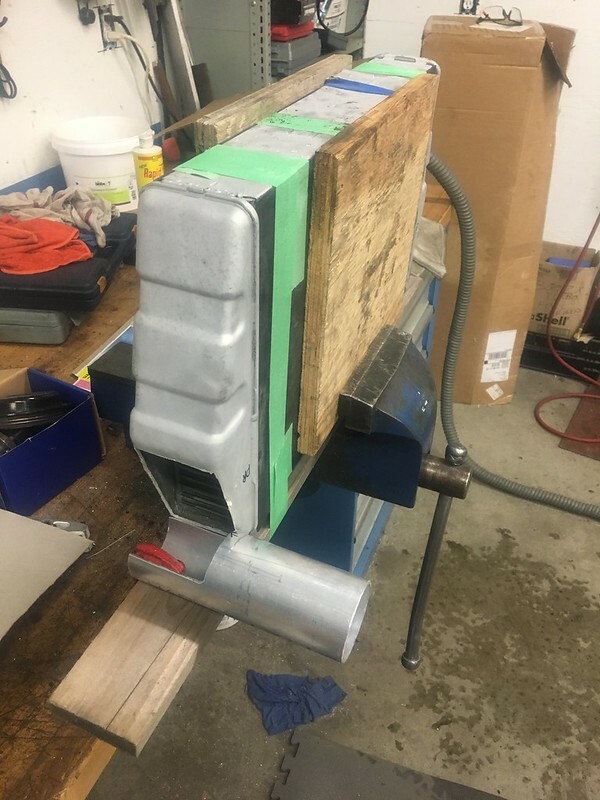 Flimsy edges Icehouse spec with 1/4" roundstock welded to stiffen and smooth. Needs bondo and paint obviously. Clamped it all into place so the mounts could be tacked on the back side. I left some shim allowance in case it had to come forward more to gain some extra rad clearance or something. Sorry, no pics! Dummy pass before wire brushing/tacking the mounts. This was after a bead blast and wire brush round 1. 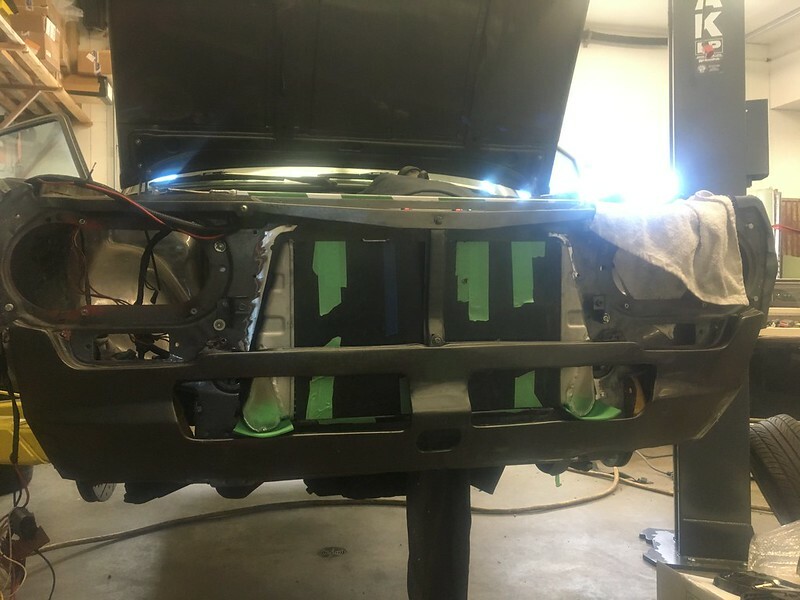 The car will live to have 4 headlights again! End tanks will be blacked out as will be the core support. With the intercooler finally placed, it's back to nice new metal on the charge pipes, BOV piping, and exhaust! 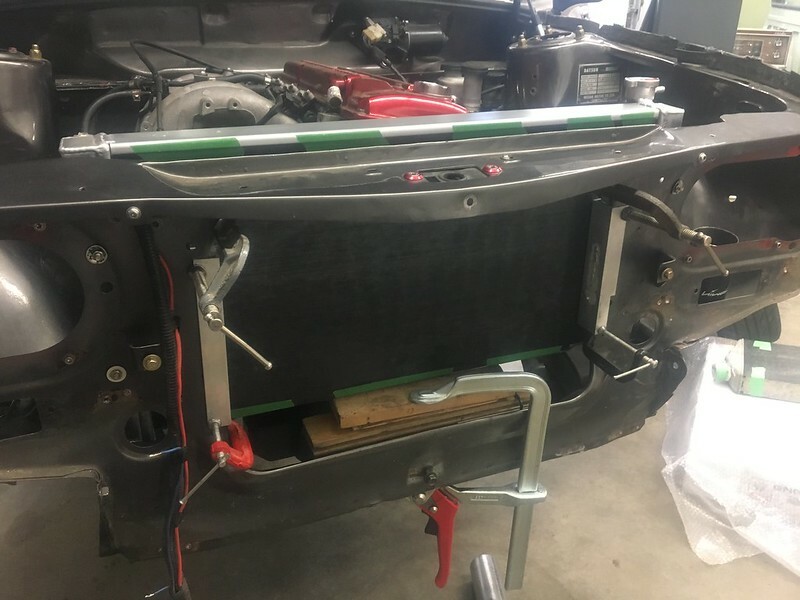 If anything happens up front, the new intercooler will have a new core and CNC machined end tanks. No more corroded stuff! 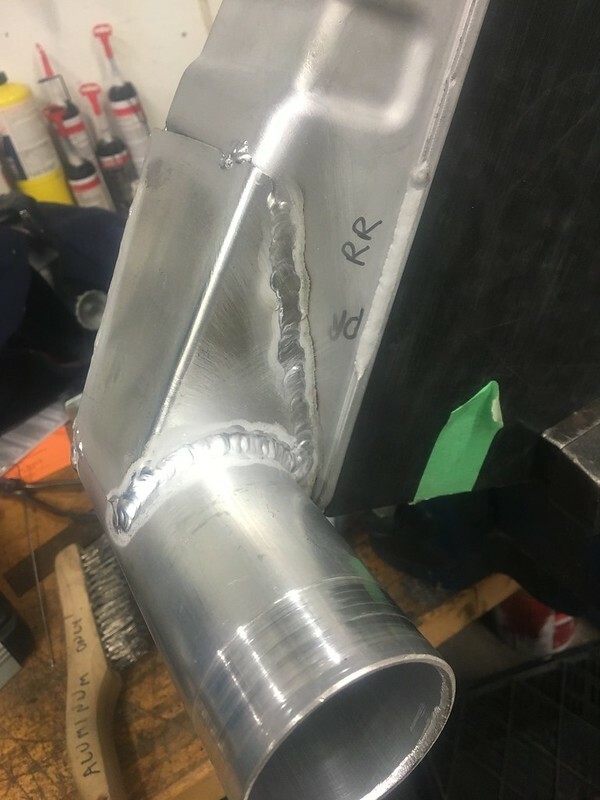 Nice work, those welds good for 30 PSI? Doubt it but should be good for 12! 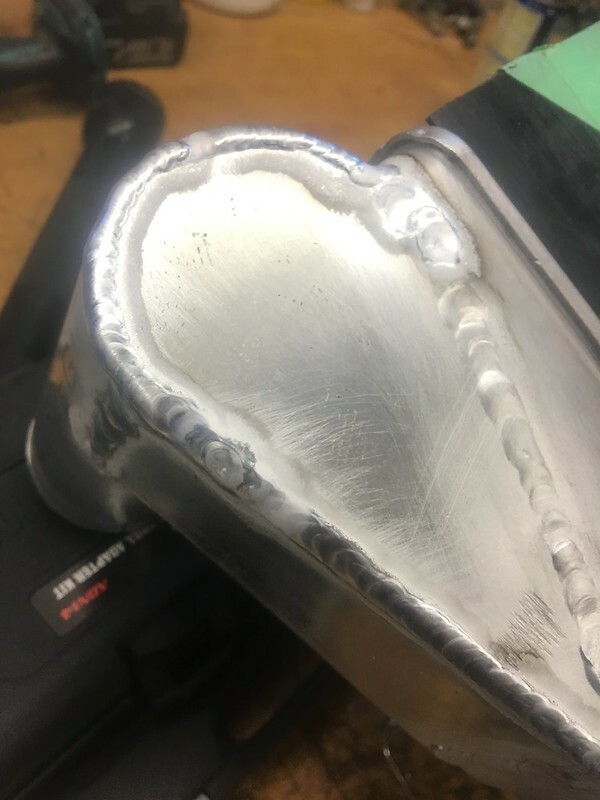 This guy I got the core from had it with 38psi on a 4G63! Nice work! With blacked out end tanks it'll be a real sleeper. 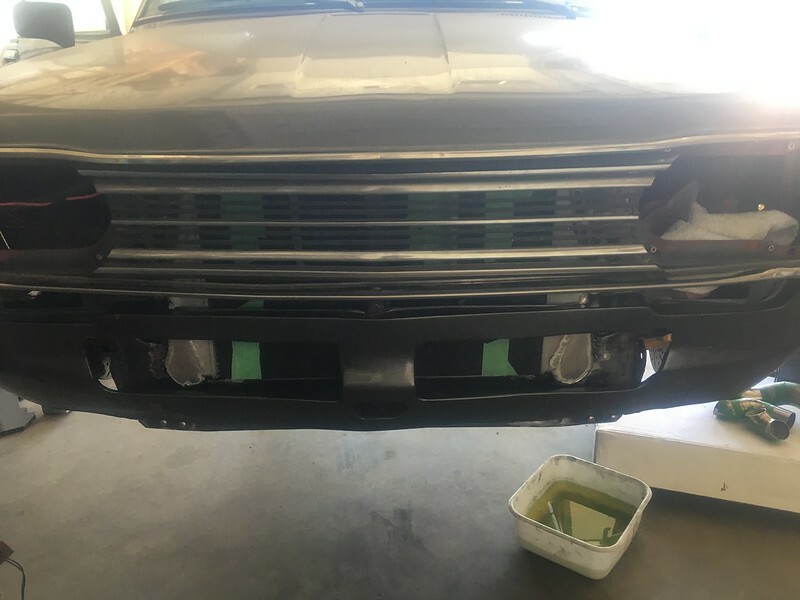 Thankfully, I headed in with the intercooler fitted so that meant I could work on on the charge piping, BOV recirc piping etc. since the start and end positions for all the pipes were established. I was actually able to precut the pieces for the hot pipe last time I was home so it was easy to tack together and fit this time around. I built a simple Excel calculator to help with pie cut calculations. It came in handy a few times on this project. 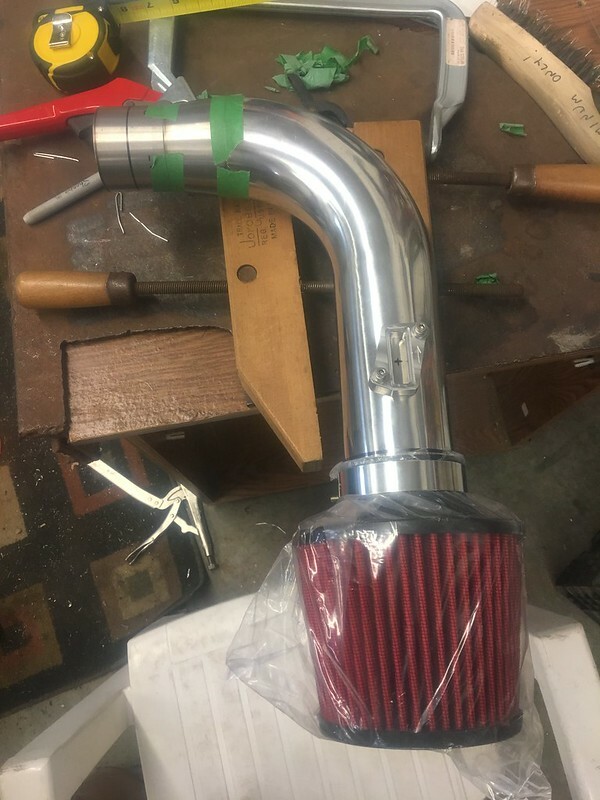 Now I was working on the cold pipe (intercooler to throttle body) which took some more time. I had a whack of pie cuts pre-made so it made the lead up to this task more manageable. Almost all if not all joints are ~15* (7.5* half angle on the chop saw). There are 22 pieces in total. 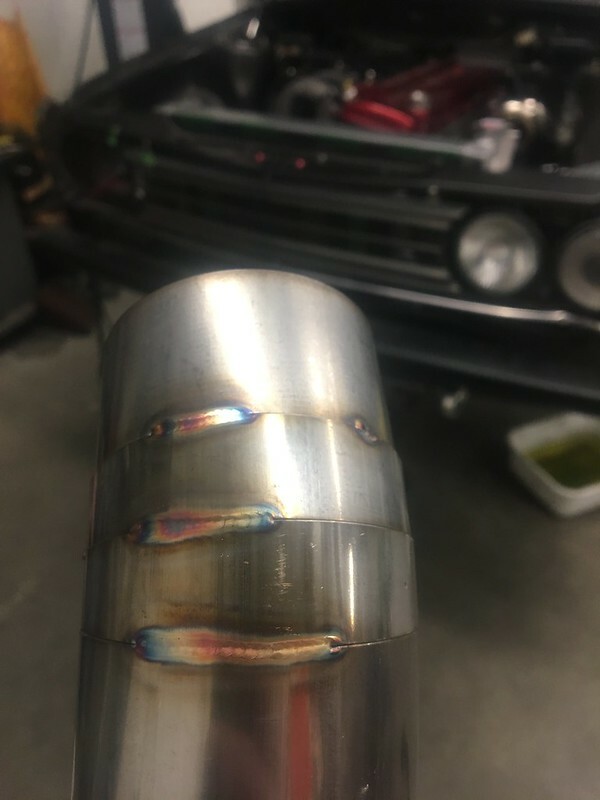 Tubing is 2.5" OD x0.065" wall 304L SS. It took some finesse to get clearance to the rad hoses, currently imaginary electric fans/shroud, and alternator. Pretty happy with the final product. 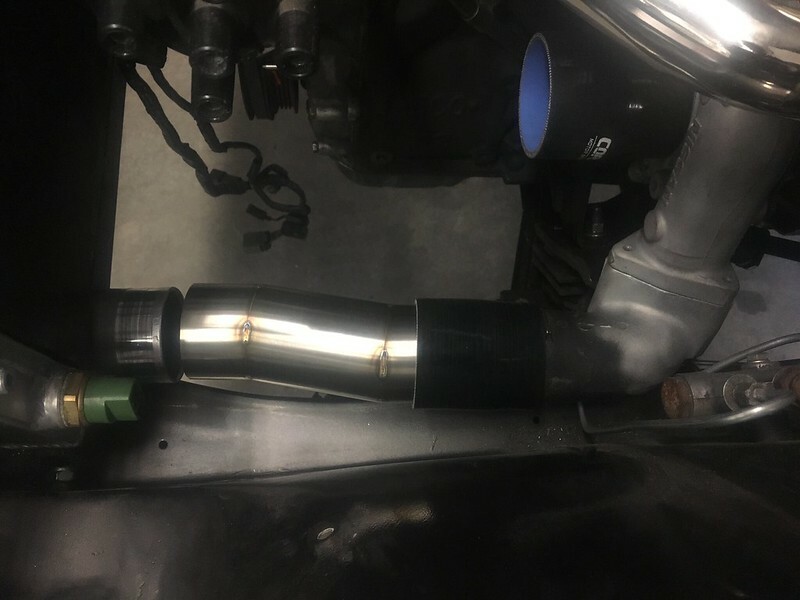 So I've now crossed off a SS intake tube from the bucket list even if it is only used for a short time. It's set up so you can easily change MAF/filter setups as you can see. I still need to purchase a 3 --> 2.75" silicone coupler for the R35 MAF purpose. 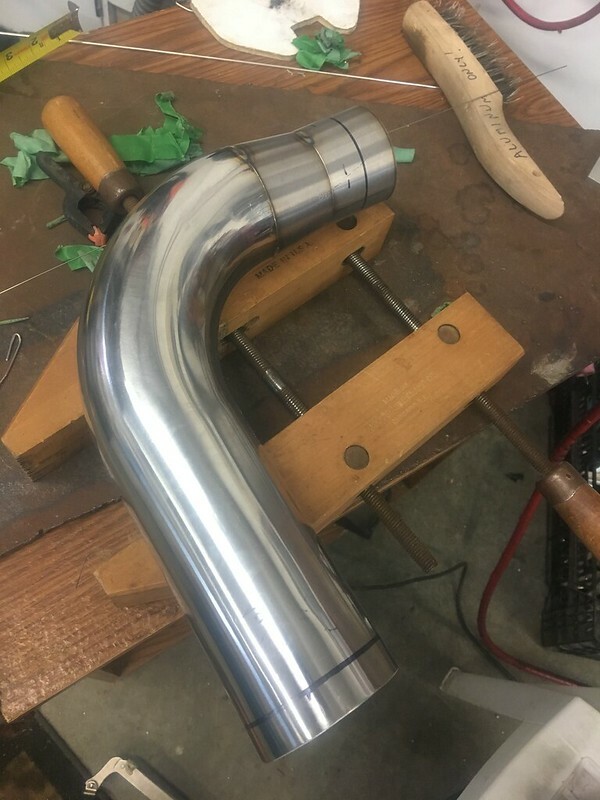 The turbo inlet is now finished with a 3" mandrel bent piece, concentric reducer and a straight section into the inlet of the turbo. You can see the slot style MAF adapter for the R35 maf in the one picture. With a few new parts in place, the engine bay ironically looks less busy than it did before. 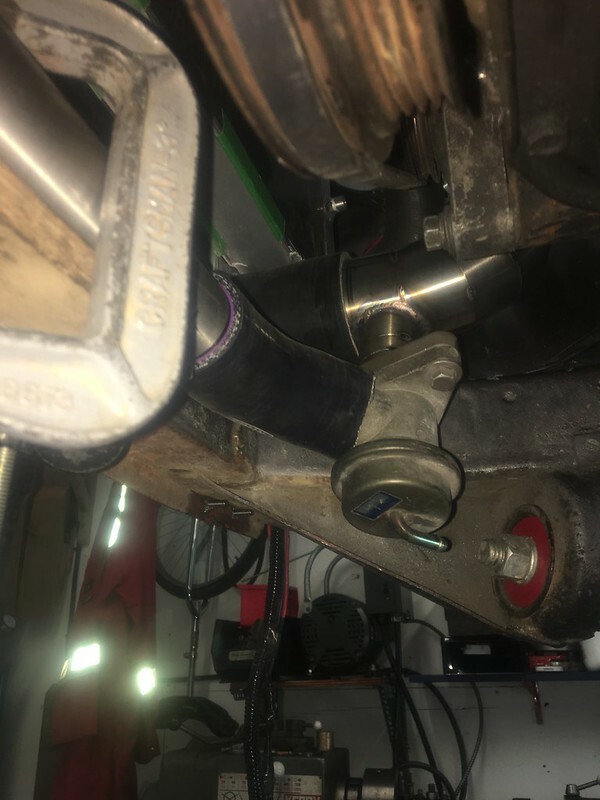 In true OE fashion, my KA-T will need the BOC recirced since it will be run with a MAF sensor. Once you measure the air, you can't let it disappear! 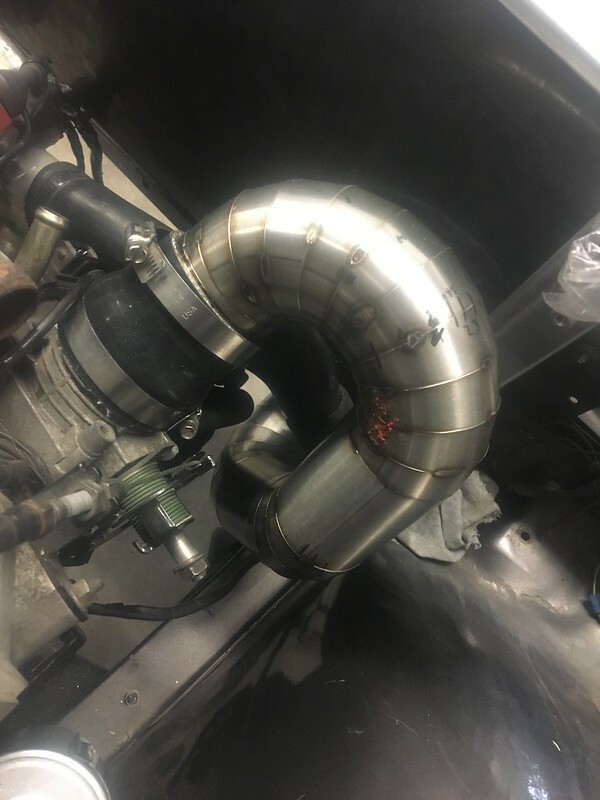 It uses a single R32 GTR BOV mounted in the cold pipe then run across the frame rail in 1.5" tube into the turbo suction. First cut. Obviously smoothed out with a die grinder after this. Tip: if you use countersunk bolts to mounts parts during fit-up, it ensures that the holes are nice and centered out. Once I have a lot of piping made up and tacked, I'll set up the back purge and weld out a lot of these items. 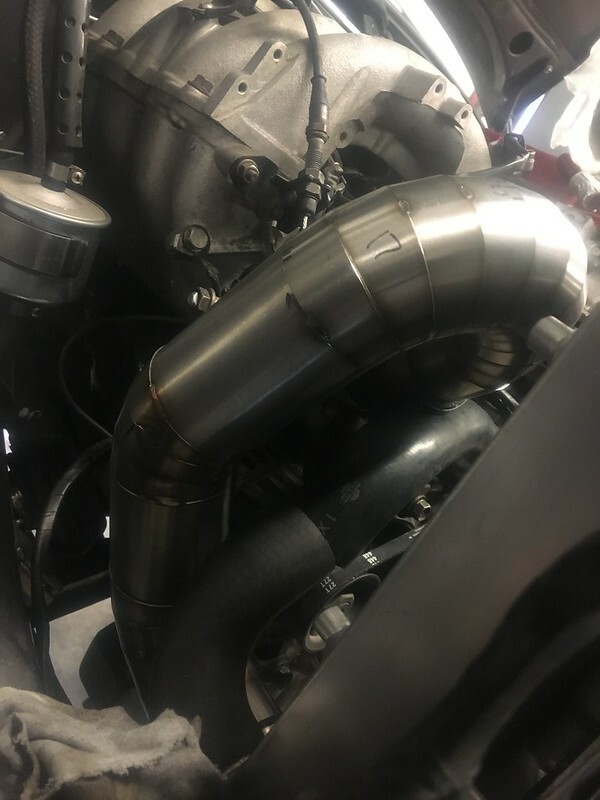 Exhaust next! 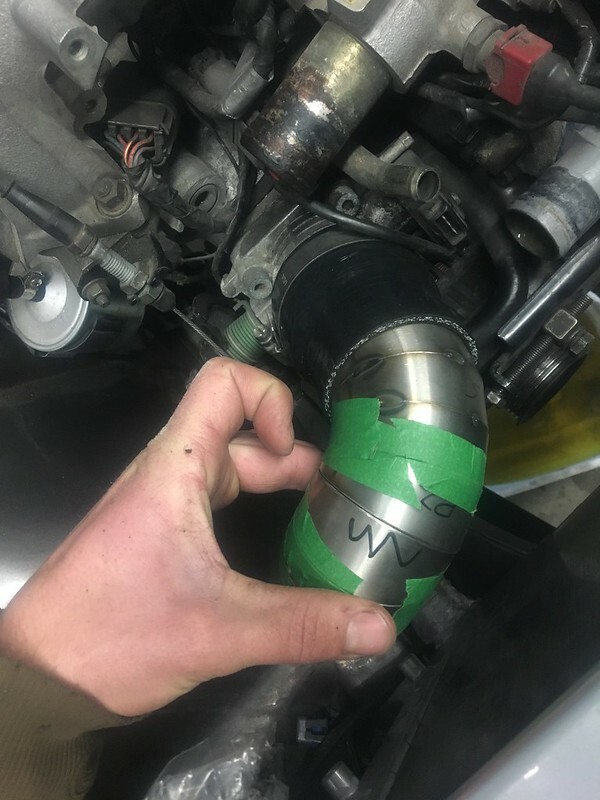 Wastegate piping challenges next time!